Chinese medicine theory believes the body's energy, or qi, circulates through energy channels called meridians. These meridians correspond to the inner organs, which are thought to govern their energy flow. Several meridians run the length of the legs, including the stomach, spleen, gallbladder, kidney and liver channels. Stimulating many of these points can affect leg health. Pain, weakness and numbness may be influenced by needling or pressing specific leg points. Talk to your doctor before trying acupuncture, particularly if you have medical conditions that affect your circulatory and nervous systems. 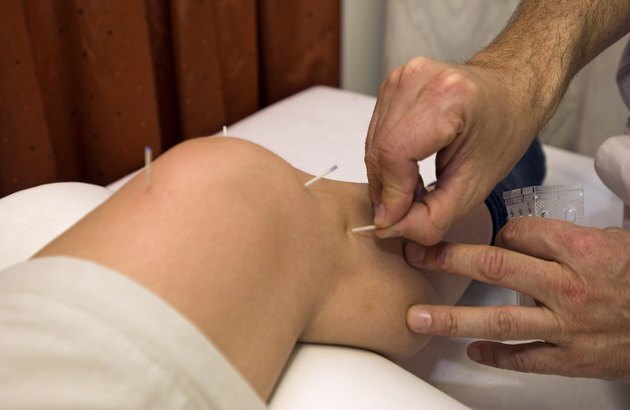 A licensed acupuncturist will begin by asking about your medical history, collecting current and past information to make a Chinese medicine diagnosis. She will also ask to look at your tongue, take your pulse on both wrists and discuss her intended treatment plan. Thin needles will be inserted into various places, and left in for between 10 and 45 minutes. During this time, you can relax and meditate while listening to music, or even sleep. Though you might feel immediate results, several or more sessions are typically recommended to adequately manage your conditions. Energy meridians run along the front, back and sides of your legs, surrounding your knee and ankle joints as well as reaching to your toes. Most points are indicated for local treatment -- dysfunctions within the area surrounding the point. They also serve other functions, such as alleviating pain, numbness and swelling, increasing energy or balancing emotions. The spleen channel can influence muscle strength, quality of blood and swelling or edema of the legs. Stomach meridian points can move energy blocks and alleviate pain, while kidney points can increase energy and reduce heat. Emotions like anger, blood disorders and menstrual problems are influenced by the liver and gallbladder channels. For pain and swelling of the legs, your practitioner may choose kidney point 1, spleen 6, gallbladder 40 and 41 or liver 3. Kidney 1 is located on each foot's sole, helping restore vital energy and strength while reducing pain and swelling. Also located on the foot, gallbladder 40 and 41 spread energy, focusing on pain in the hips, lower legs and feet. Spleen 6 can help regulate dampness, resolving swelling around the inner ankle area -- where it is located -- and the lower leg. Numbness and weakness in the legs may be regulated by stimulating gallbladder points 29 and 31, as well as stomach 33 and 37, kidney 1 and 9 and bladder 40 or 58. Located in the hip, the outside thigh and the front thigh areas, respectively, gallbladder 29, 31 and stomach 33 are indicated for numbness or weakness in the lower extremities. Kidney 9 and stomach 37 are found on the lower leg, while bladder 40 and 58 are found near the back of the knee and calf, respectively. Each of these points can alleviate pain, numbness and weakness in the legs. Yin Yang House: My Spleen is What?